It wasn’t my normal Sunday, yesterday…At 9am, myself and my partner in crime, headed north east to Lochgelly. 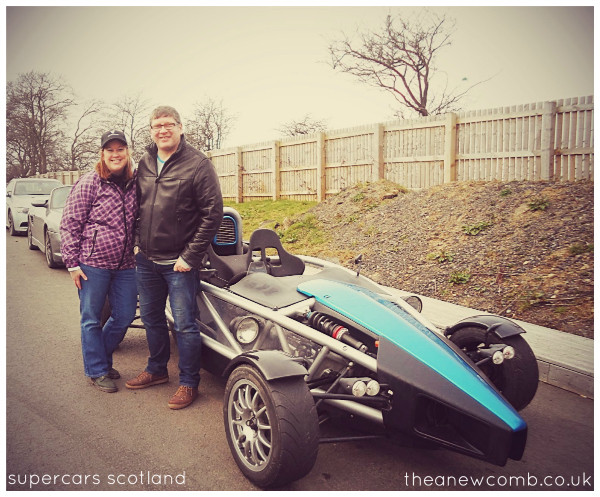 By 10am, we wound up in Fife at Driftlands race track to have some fun in some of Scotland’s “super cars”. When you arrive at Driftlands, in Lochgelly (Fife), you get your pick of some beautiful automobiles. There are some real beauties to choose from. Audi, Lotus, Porsche, Lamborghini (well that one wasn’t there yesterday, but they do have one! )…The gorgeous Aston Martin arguably caught my eye first. Silver with some reddish interiors, it was easily my first choice. The second one was harder to select. The Black Ferrari? Perhaps the Black Porsche? Or maybe the wee, Blue Lotus? I had a radio buddy of mine who had a Lotus so I didn’t want to go with that. 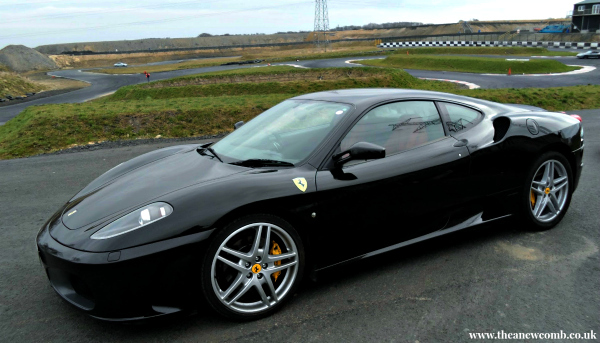 I do love Audis so that was an option….In the end, it had to be this little Italian stallion…the Ferrari. 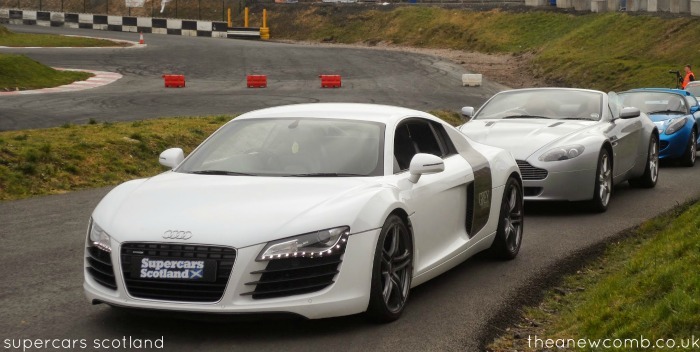 The Supercars Scotland guys take you through a safety demonstration and give a little history of the company, and their three driving venues or tracks (all currently in the East). One thing that impressed me most was how friendly, helpful, and knowledgable the staff were. Being around people who love what they do, and who have passion for their work is a real bonus. 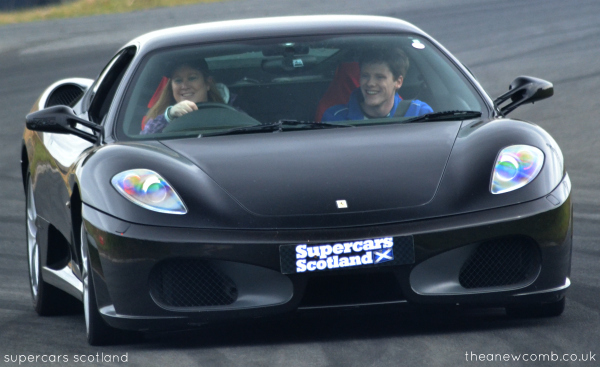 The Supercars Scotland team truly made the day for us! 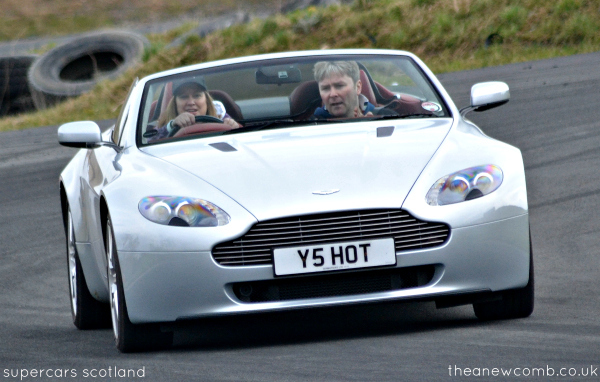 So the first car I drove was the Aston Martin. To be honest, I don’t know what model it was, but I am sure someone out there can tell me. I didn’t care. Any Aston Martin would be fine by me! I am not that fussy! You can tell I was having a good time navigating her here. All smiles. This Aston Martin which was a most-glorious piece of silver machinery stole my heart. The gear shifts on the steering wheel threw me just a little, but by the first lap I sort of got the knack of it. Frankly I could have exited the track and ventured up the east coast in this baby. Someday maybe I will…I’ll add this shot to my vision board! After the Aston Martin it was time to have a shot in the Black Ferrari. Growing up in the town I did, we actually had a Ferrari garage. That said I’ve never in my life been in one of these beasts. The last thing we did was ride in the “Drift Taxis”! This is where you climb into a fairly hollowed out car that skid out all over the track, and burns some crazy rubber (which stinks to high hell by the way). It was fun. My car raced Ken’s and we won. There’s a video to be added later but for now – just take my word for it – these were a riot. A smelly riot. By mid-day we drifted off Driftlands on a real adrenaline high and headed further east to Anstruther for some award winning fish and chips. A good time was had by both of us. One we’ll not likely ever forget. If you’re interested in cars – or know someone who is – these sorts of supercars experiences would make a fantastic gift. Just ask my buddy Ken! PS: Check out their promo video to learn more about what Supercars has to offer the car lover in your life.